HOW could the way you look after your lawn next spring and summer affect nearby waterways? Justask Richard the frog. 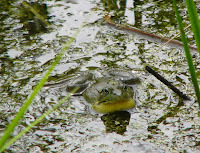 He's the bullfrog that sang the blues for Twinkle Toes on Main Duck Island and gave her item #2 on Sid and Richard's list of how to help our water. Lawn care can pollute nearby water. Both Richard and Sid want you to remember healthy soil means healthy water. And you can't have a nice lush green grassy lawn if the soil isn't healthy. The Internet says lawns in suburbia on average receive ten times the chemical pesticides per acre as farmland and that nationwide at least ten million pounds of chemical fertilizers and pesticides go on lawns and home gardens each year. That's a lot of potential pollution. It also says the typical pesticide applications used on lawns kill 60 to 90% of your worms-and with fewer worms your turf soil is less healthy. Healthy soil is key. Experts say check your soil pH and add lime if needed, and add compost whenever you can. Compost helps your soil resist compaction and retain water and nutrients. The easiest way to add compost is leave your lawn clippings on the grass. You can buy inexpensive soil test kits at garden stores or try the Cornell Cooperative Extension service in Newark for information. If you must fertilize with chemicals use a time release nitrogen fertilizer and avoid phosphates. Slow release will help keep nutrients from washing into the bay or lake. And don't rinse out your sprayer and fertilizer gear on a paved driveway. Some types of grass like the various fescues require less fertilizer than Kentucky Blue Grass. Check out some of the alternative grasses like slow growing buffalo grass at http://www.american-lawns.com. Fight weeds without herbicides. Try spot treating the weeds with vinegar (which will burn your grass so be careful to spray it on just the weed) or try corn gluten instead of Round Up. Richard wonders could you train your dog to pee on the weeds? If your soil is strong and healthy, the grass will have an easier time crowding out the weeds and you won't need weed killers. Another aspect of lawn care that impacts water is mowing. The typical four cycle lawn mower puts out ten times as much air pollution in an hour as a new car. A two cycle leaf blower motor puts out even more pollution. Air pollution eventually ends up in water in a variety of ways. So mow less often. It's suggested by the sustainable lawn websites that your set the mower as high as possible and that taller grass helps shade out weeds. Mowing less often causes the grass to grow more slowly according to the Internet. I have personally observed this to be true for the mixed grasses and clover in my Wayne County lawn. Expert lawn care folk also say don't water the lawn too often. A healthy lawn needs about one inch of water a week. Excess water can leach chemicals as it runs off. If you have a small lawn, consider buying a human powered lawn mower -a “reel” one. Reel type mowers are used on golf courses because the reel blades shear off the grass and make a cleaner cut. 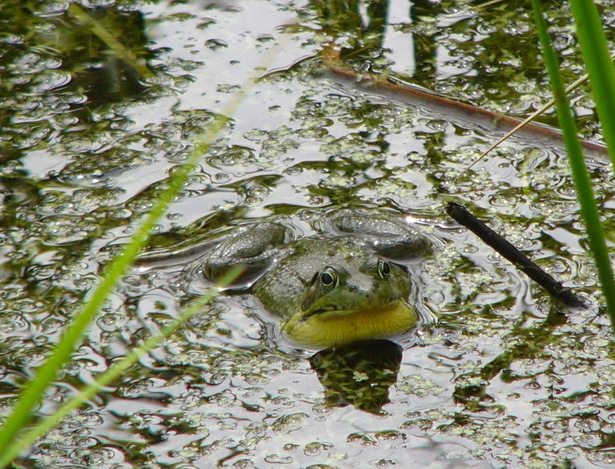 They are quiet, don't need gas, and the frogs and toads will probably have plenty of time to get out of the way. You'll get a “light aerobic workout” when you mow according the the Internet. If you don't let the grass get too tall. If you want to be adventurous and if your neighbors don't care or you don't care what they think, you can experiment with a 'natural' lawn. (This can get to be pretty good workout to mow with that hand push mower if it gets too tall). I love to watch the bees and other native pollinators working on the white clover blossom patches in my lawn and personally I think the golden galaxy of dandelions each spring is beautiful. I pick the young leaves for greens or salad and the flowers dipped in egg and flour batter and fried up make great dandelion fritters. Do you remember how many creative things you did with dandelions when you were a kid? This column is adapted from Sid's List 12 actions to help our water in “Twinkle Toes and the Riddle of the Lake” available at www.chimneybluff.com or as an Amazon Kindle book. 0 Comments to "HOW - Helping Our Waters #2"